Earth is heading into its third year of above average sea ice cover, as government scientists, politicians and the press continue to insist that the poles are melting. 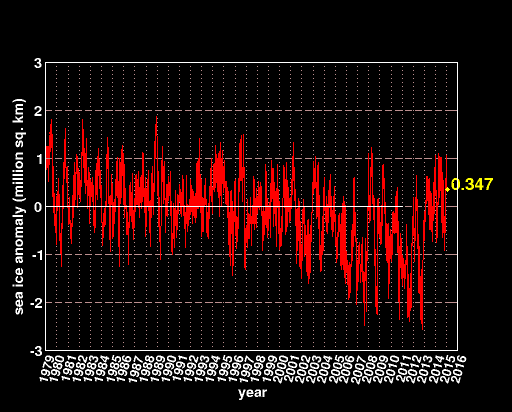 Somehow they can’t grasp the fact that sea ice is an indication of cold at high latitudes. NASA and NCDC will announce today that Earth was the hottest ever in 2014, ignoring their own satellite data, and destroying whatever smidgen of scientific credibility they had left. Why would NASA trust their own satellites, when they have a piss poor network of surface stations which doesn’t cover much of the planet, and they insist needs to be massively adjusted? NASA GISS and NOAA NCDC both need to be shuttered, and the leadership of both agencies investigated for fraud. Both agencies have become bought-and-paid-for shills for their political bosses. Their primary aim is to provide AGW frightmongers with data — carefully massaged and manipulated to create a warming signal — that will keep the funding pipeline open and their jobs safe. They aren’t scientists; they are con artists and should be prosecuted. They’ve bilked taxpayers out of hundreds of billions of dollars and are contributing to the shutdown of this nation’s coal-fired power plants, leading to rising energy costs and leaving all of us at the mercy of Mother Nature. Despite Ted Cruz pushing increased budgets at NASA, since Appollo, it is nothing more than a typical corrupt, wasteful government bureaucracy. The myth of the vast intelligence of NASA should be put to rest. The reality is it is comprised of individuals who could not get a real job in the private sector that has been riddled with diaster after disaster. The shuttle program probably cost twice as much to deliver satellites than conventional rockets, two shuttle explosions, a space telescope put in orbit without being able to focus, a probe who’s antenna wouldn’t deploy and James Hansen just to name a few NASA programs for billions of dollars. My brother is one of those folks you say could not get a job in the private sector, and you would be wrong. His career has been one of great success, starting as a military man. If I were to tell you even one of his former high profile jobs you would be able to name him. He is the reason I started using a pseudonym, to protect him from political backlash that could result from my online activity. He has had to testify in front of congress more than once, because of lies told by politically motivated peers. If you want to attack wasteful government spending, NASA is way down the list. If you want to attack NASA employees, please be more specific. I agree gator. The GISS deserves what it gets but much of the rest of NASA still is as viable and necessary as ever. It is not NASA’s fault we don’t have a manned space vehicle and haven’t returned to the moon yet and aren’t already on Mars as we should have been years ago. Though Hubble’s optical problem was a fundamental screw up for which there can be no acceptable excuse, and the same goes for the crash of the Mars climate orbiter. But NASA has accomplished much in space exploration. Hubble has paid back it’s costs with real data and discoveries in spades and after 24 years in orbit is still in service which is remarkable. Both of the original Mars rovers far outlasted their life expectancies. And though Galileo had it’s problem with it’s main antenna it still provided fantastic data. The list goes on and on and successes far outnumber failures. Sorry, I can’t agree, practically all the things that you mention were designed and created before NASA’s obsession with “Man Made Global Warming”, which all stemmed from Hansen. Once the Space Race ended NASA has been going down hill ever since. There have been some great interviews with past NASA admin highlighting this. My brother’s job has nothing to do with AGW. In fact, he was so unaware of the malfeasance at GISS that he did not believe it until I showed him the fudged data that Hansen et al were passing as science. NASA employs over 18,000 people, and has many missions, and all for less than half a cent from each tax dollar. And keep in mind that it is one of the only tax consumers that actually produces something other than hot air. Hansen is not all that. I’ll second gator’s comments. My wife works at NASA and I have done work for them as well. There are large parts of the agency that do good and necessary work. Our federal government is charged, Constitutionally, with protecting us and owning and controlling the high ground is a military maxim. Would we cede control of the oceans? I think not. (Although Obama’s destruction of the military makes it likely.) NASA, like all the other agencies, has been hijacked by politicians, bureaucrats and Progressive loons and needs its house cleaned badly. At least they have a Constitutional purpose. Many of the others like the EPA shouldn’t exist at all. Not the GISS in general but the GISS Earth sciences division is the turkey. Should have been more specific. …our algorithm is working as designed. If you are going to use this data in your argument, perhaps, in fairness, you should look at all the data and discussion at http://arctic.atmos.uiuc.edu where this came from. I’m interested in their data, not their propaganda, thanks. Calculated with very few actual measurements. Strangely, the USA with the best records has the least changes even after adjustments, while the area with the least certainty has the biggest. The plot does not expand to a larger image and instead takes you to another site to load the data (probably another trillion GB file). I take it that the data is modelled rather than measurements and is inconsistent with previous work and news paper reports. A better plot to highlight that that there are many 12 month periods that have been hotter.